Before Demian Maia and Kamaru Usman close the show in Santiago, Chile on Saturday night, fans at Movistar Arena will be treated to a women’s strawweight battle featuring not only two of the top emerging talents in the division, but two of the top female prospects in the sport today, as Alexa Grasso squares off with former Ultimate Fighter winner Tatiana Suarez in the penultimate bout of the evening. Hailing from Guadalajara, Jalisco, Mexico, Grasso arrived in the Octagon as one of the most hyped young females in the sport. After posting four consecutive victories in the competitive 115-pound ranks under the Invicta FC banner, including back-to-back wins over Mizuki Inoue and Jodie Esquibel, Grasso maintained her perfect record through her promotional debut, outworking Heather Jo Clark to come away with a clean sweep on the scorecards. Returning to the cage four months later, the 24-year-old suffered the first loss of her professional career, coming out on the wrong side of a unanimous decision verdict against veteran Felice Herrig on Super Bowl Saturday in Houston, Texas. When the UFC returned to Mexico City six months later, so too did Grasso and the national star rebounded from her setback against Herrig with a split decision victory over another member of the TUF 20 cast, Canadian Randa Markos. Recovered from knee surgery and ready to resume her ascent up the strawweight rankings, the ninth-ranked Grasso brandishes quick, crisp hands and a bottomless gas tank that allows her to maintain a steady pace inside the cage. When she’s at her best, the Lobo Gym product willingly enters into the fray, trusting her chin, confident that she’s going to get the better of whatever exchanges are to follow. A two-time bronze medalist in freestyle wrestling at the World Wrestling Championships, Suarez had dreams of competing at the 2012 Olympic Games in London, but they were dashed by a neck injury. During the imaging to diagnose the issue with her neck, doctors discovered a cancerous growth on her thyroid, prompting the Covina, California native to undergo radiation therapy. Upon her recovery, Suarez transitioned into Brazilian Jiu-Jitsu and eventually found her way into MMA. Just a handful of fights into her professional career, she was selected for the cast on Season 23 of The Ultimate Fighter and after being the first pick of Team Gadelha, Suarez steamrolled the competition, submitting JJ Aldrich, Kate Jackson and Amanda Cooper to become the third female Ultimate Fighter winner in UFC history. 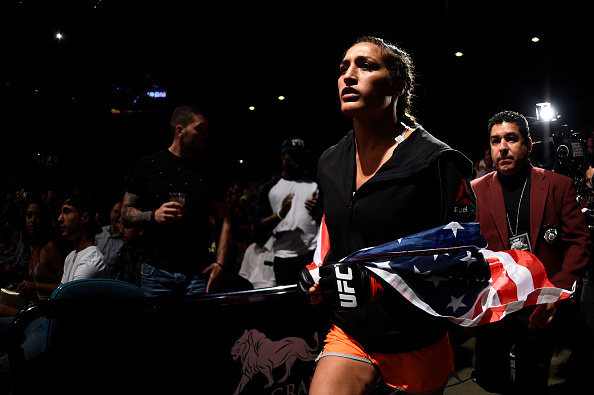 Following her bout with Cooper, Suarez was forced to the sidelines with a torn biceps tendon and torn labrum, which ultimately kept her out of action for well over a year. When she did return in November 2017, she picked up right where she left off, marching into the Octagon and turning in a dominant effort to bounce Viviane Pereira from the ranks of the unbeaten. Rose Namajunas’ ascension to the strawweight throne has created opportunities up and down the divisional ladder and Saturday’s contest between Grasso and Suarez is a chance for each of the young upstarts to state their case for contention and establish themselves as the top emerging threat in the division. Both women are currently ranked in the Top 15 – Grasso at No. 9, Suarez at No. 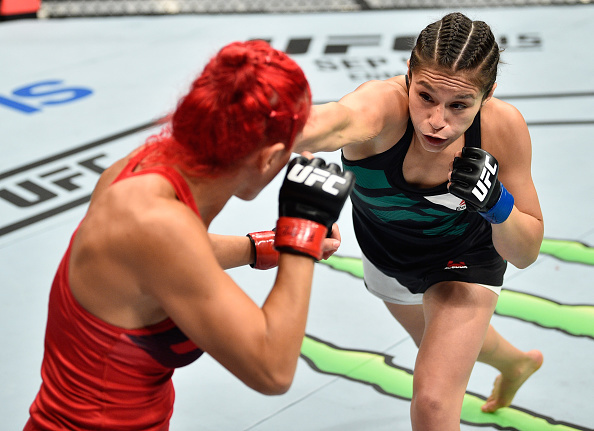 12 – and a strong showing for either could set up an opportunity to share the cage with one of the more established veteran talents in the division in the second half of 2018, as fighters like Michelle Waterson and Karolina Kowalkiewicz look to return to the cage after picking up victories earlier this year. Stylistically, this is an intriguing matchup, as Grasso works best when she’s light on her feet, firing off punches and kicks and cutting angles, while Suarez relies on her tremendous grappling attack to bring the fight to the canvas and overwhelm the opposition with her strength and submission acumen. Who is able to dictate where this fight takes place will be a key factor in determining the outcome and that chess match should make for an entertaining contest on Saturday night in Santiago, Chile.